As the 19th century became the 20th, Fifth Avenue around Madison Square was seriously changing. Since the years just prior to the Civil War the brownstone mansions of New York’s wealthy co-existed with the grand Fifth Avenue Hotel at the northwest corner of Fifth Avenue and 23rd Street. However the exclusivity of the $2 million hotel that hosted princes and presidents prevented it from being considered “commercial” and thus detracting from the high-end neighborhood. The same could be said for Delmonico’s. 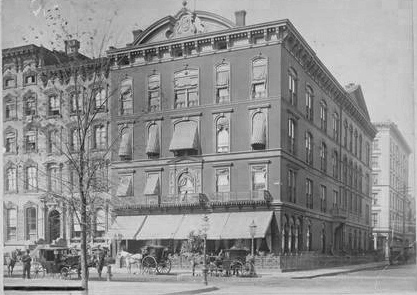 The fashionable restaurant razed mansions in 1876 on the southwest corner of Fifth Avenue and 26th Street to erect its uptown branch. But its elite patronage pardoned its intrusion into the residential area. That would all change, however. Fifth Avenue’s millionaires fled northward as commercial interests crept up from Washington Square. Mansions were converted to business purposes or replaced by loft-and-retail buildings. The entire row of mansions on the east side of Fifth Avenue between 26th and 27th Streets was purchased and converted into the Hotel Brunswick. The wide brownstone stoops were removed and cast iron storefronts installed at sidewalk level. The venture did not succeed, however, and the Brunswick closed its doors around 1893. The windows of the upper floors remained dark and vacant as shops continued to do business from street level. 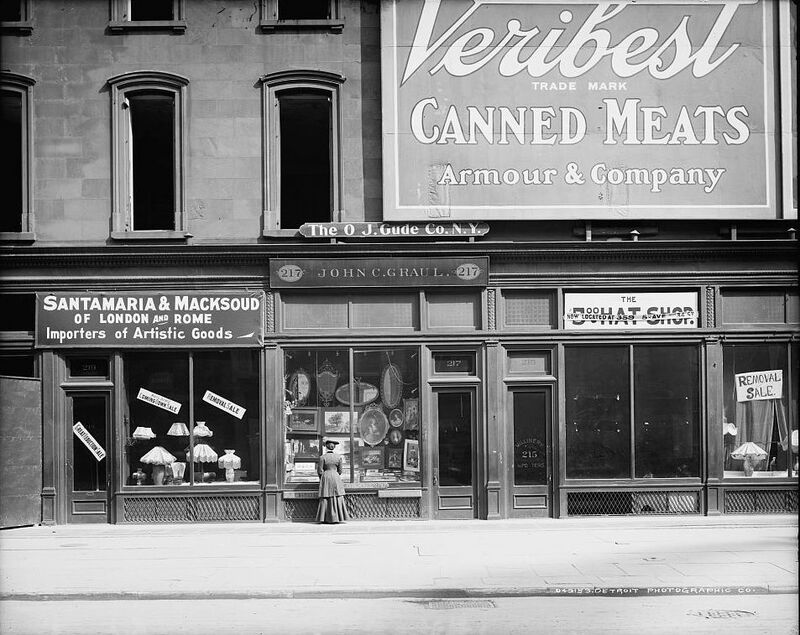 Here domestic goods and millinery were sold alongside John C. Graul’s art store. Framed mirrors, hand-colored prints and reproductions of old masters were offered to female shoppers looking to re-do their parlors. The Hotel Brunswick sat empty for a decade as the area continued to change. In 1899 Delmonico’s left its corner building. Two years later ground was broken at 23rd Street and Fifth Avenue for the soaring new skyscraper that would become known as the Flatiron Building. A year later, on November 13, 1902 The New York Times reported that the old Hotel Brunswick would be razed and “a twenty-story hotel will be erected on the property.” The new Brunswick Hotel would cost an estimated $7.5 million -- $2.75 million for the land and another $4.75 million for the building. In the early Spring of 1903 a photographer paused in front of John C. Graul’s art shop. Plastered across the façade of what had been the proud residence of one of Manhattan’s most prominent families was a billboard advertising canned meat. The carved brownstone frames of the old mansions still remained, although the windows had now been removed. The $5.00 Hat Shop at No. 215 was already empty, having moved a block northward to No. 359 Fifth Avenue. Two other shops displaying table lamps in their windows advertised their removal sales. And a young woman in a woolen spring outfit stopped to window shop before John C. Graul's. The photographer managed to trap in time a poignant moment—a photograph not simply of a woman shopping for discounted artwork; but of a New York City that often lurches into the future, destroying its own history in doing so.